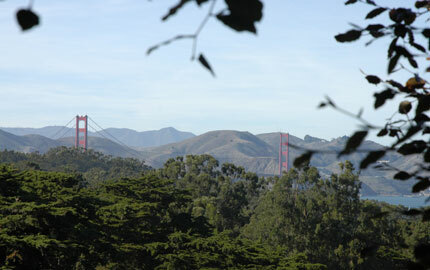 Elegant contemporary townhome with romantic views of the verdant Presidio parklands and pristine Bay from all three levels. Light & airy ambience throughout. Observe, or better yet, join the lively family sports activities at Julius Kahn playing fields and Presidio cultural and community activities. Convenient Laurel Village & Sacramento Street shopping & dining. City living at its best! Gated entry through the sunny landscaped patio/garden. Light-filled foyer entrance with tall transom and inside access from the garage. Powder room. Bleached hardwood floors & halogen lighting throughout. Lovely views of the Presidio and Bay from the step-down LIVING ROOM with tall ceiling, limestone fireplace, and view of the Presidio & Bay. The formal DINING ROOM has been exquisitely faux finished. 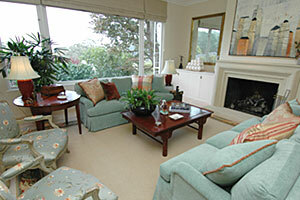 French doors open onto a charming balcony which overlooks the front patio/garden. The light & bright gourmet KITCHEN has been published in Northern California Home & Design: a Magazine of Design Excellence. Designed by the team of Cable & Lockyer, the kitchen features a large slanted skylight, custom maple cabinets with frosted glass insets, brushed steel hardware, granite countertops with slate backsplash and a pair of hanging lamps above the breakfast seating area. 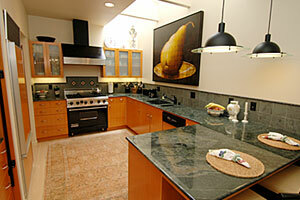 Top-of-the-line appliances include: Viking 6 burner stove & Sub-Zero refrigerator/freezer. Gracious staircase with wrought iron banister & custom runner. 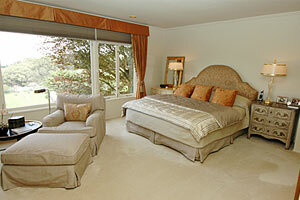 Tranquil view MASTER BEDROOM overlooks the Presidio and Bay. The luxurious MASTER BATH designed by Dan Phipps features a double maple vanity with marble surround & gray stone backsplash, mirrors with elliptical sconces, glass display shelves, spa tub & separate shower. Ample custom wardrobe storage. Second sunny BEDROOM and adjoining BATH, published in Home & Design, with limestone surround, mirrored vanity with double chrome sinks. Delightful FAMILY/MEDIA ROOM with views of the Presidio and Bay, marble fireplace with built-in desk and glass shelving on each side & wet bar. Step out to the sunny, sheltered and private deck. Tiled BATH adjoins. Third BEDROOM, presently used as an exercise room and third BATH. Step out to the rear patio/garden which enjoys the afternoon sun. Laundry area and additional storage. 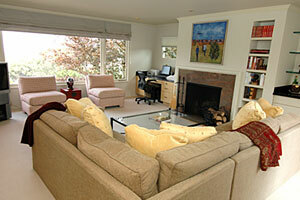 Two car tandem GARAGE with inside access plus driveway parking within the gated front wall.